These avian friends came to us from Bay Beach Wildlife Sanctuary. 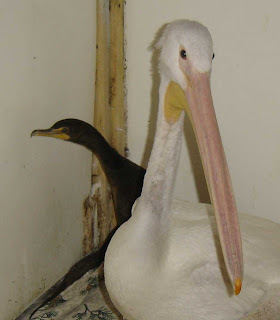 The larger bird is an American White Pelican (Pelecanus erythrorhynchos) and the smaller bird is a Double-crested Cormorant (Phalacrocax auritus). Help us name these two new birds, blog us back or email us at raptoreducationgroup@gmail.com and we will blog the winning staff favorite soon! 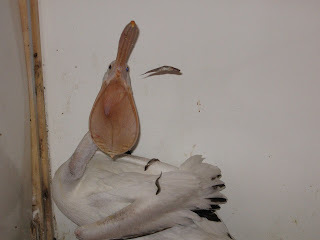 Our Pelican loves catching his fish at dinner time. White Pelican - looks like a "Decker"
DC Cormorant - looks like a "Spike"